Chicago, IL–Chicagoans occupied a Citibank Branch on Chicago’s Magnificant Mile shopping district to demand they stop funding the Dakota Access Pipeline immediately. Over the past several weeks, thousands of Native Americans and allies have convened in Cannonball, ND to support the Standing Rock Sioux tribe as they resist the construction of the pipeline. More than forty people have been arrested for engaging in civil disobedience in North Dakota and Iowa in an effort to halt the construction of the pipeline. The Citibank branch occupiers, held banners and signs and chanted inside the branch for ten minutes interrupting business at the bank. Once the police came, they went outside the branch and handed out fliers to passersby that explained how Citibank is profiting from the Dakota Access Pipeline by bankrolling the construction costs. The Dakota Access pipeline will cross multiple water sources, such as the Missouri and Mississippi Rivers. This pipeline threatens peoples drinking water and will contribute greatly to global climate change. Two weeks ago, Energy Transfer Partners, the company that is building the Dakota Access pipeline bulldozed sacred burial sites in order to move forward with construction of the pipeline. Land protectors tried to intervene and were sicced by dogs handled by security. Several land protectors, including one child were bitten by the dogs. Event attendees demanded that Citibank stop funding the Dakota Access Pipeline project as funding the pipeline is directly resulting in the desecration of the sacred sites of the Standing Rock Sioux tribe. Energy Transfer partners, has justified the need to take land via eminent domain for the pipeline by saying that it would help national energy security, but this network of pipelines will allow oil that has been obtained from a controversial practice, hydraulic fracturing or “fracking,” to be exported all over the world from the Bakken Oil patch in North Dakota. Protestors pressed Citibank to stop funding the Dakota Access pipeline because it will contribute greatly to the human misery and suffering caused by global climate change. “It is unlikely that Citibank customers support poisoning Indigenous peoples’ water, desecrating sacred burial sites, or contributing to global climate change. 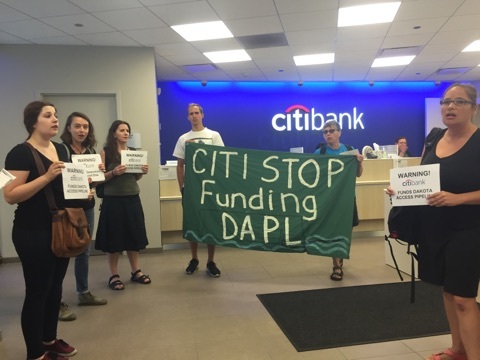 Citibank bankrolling the Dakota Access pipeline, means that you are funding human misery, racism and cultural genocide,” said Gloria Fallon of Rising Tide Chicago. Organizers of the event plant to target Citibank, and other investors like TD and Muzuho Bank until they revoke the line of credit extended to Energy Transfer partners to build the Dakota Access Pipeline. Thanks to the protestors for protecting our environment.